The first kind of Christian gets angry, boycotts the movie, and forwards cautionary e-mails to friends and family. The second kind of Christian responds, "An atheist wrote it? Hmmm. That sounds interesting..." And then he goes and buys the book, reads it, and attends the movie with his friend Kyle to see what's up. I like the armored bears. In a great twist of fate for this blog, science in Lyra's world (Lyra is the protagonist of The Golden Compass) is called "experimental theology." 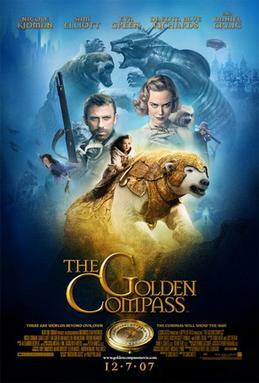 "Cutting" in the name of religion and for social control is a big symbol in The Golden Compass. The religious overtones echo circumcision and eunuchs. The social control overtones echo female circumcision and lobotomy. There seems to be a lot of Eastern spirituality in the books. Dust, early in my reading of The Subtle Knife, appears conscious. Plus, Dust is what makes the alethiometer (the Golden Compass)--a tool of divination--work. In short, Dust seems like the Tao and the alethiometer is the I Ching. Pullman is mischievous with his depiction and naming of dæmons. Dæmons are soul-like animal companions all humans have in Lyra's world. The playful thing here is that the "demon" is the "soul." And the "church" is trying to "cut out" the "demon" to control the people. But, as we see in the book, what "the church" calls "demons" are really our "souls." Get it? The big bad church is trying to exorcise the demons of the world but they are (malevolently?) mistaken: They are actually killing people's souls in order to better control them. But the most interesting thing about dæmons is how they echo Christian orthodoxy about the fundamental features of the Imago Dei. More specifically, dæmons evoke notions of the Trinity. That is, in the doctrine of the Trinity God is never "alone." God is defined as a community. In Lyra's world human personality is always communal. People are not singularities. Loneliness doesn't exist. I prefer non-fiction. But I do like the armored bears. I think you might have missed a third group of Christians (at least): those who have neither been attracted to nor repelled by the controversy surrounding the movie. This includes me; I just don't really care, just as I didn't really care when The Da Vinci Code came out in theaters. I do like the "experimental theology" connection, though. I find it funny you keep mentioning the bears... maybe they're really worth seeing? I ran across a blog of a friend yesterday who made a post about this movie. It was a long tirade about the movie that I was too lazy and uninterested to read. Plus he clearly stated people in the church shouldn't see it. That being said, maybe I want to see it now. I often find myself running in the opposite direction of what traditional church tells me to do. I was being a bit funny about the bears, but I actually do think the bears are the most interesting thing in the book and movie. Are they "worth" seeing? Hard to say. As some guidance, I'd give the book a grade of "B" and the movie a grade of "C+". I hope you will post renewed impressions after you finish the second and third books! In my opinion they change the tone of the story into something unrecognizable compared to the first book. I probably fall into that third category mentioned above. DaVinci Code was a better movie than book. Dan Brown's prose is so junior high. I can't finish a fiction novel anyway. I am still halfway through Q which is excellent and The Last Temptation of Christ which is also excellent and beautifully crafted. By your review I would say that anyone that digs something that calls into question oppressive structures should find something of value here. See Anabaptists as a reference right? That may be, but I always prefer accuracy over parsimony. Especially when it applies to me. I should also note that I think I would like to read the books (probably not see the movie) for what appears to be an underlying motivation throughout your comments - just to tear apart Pullman's treatment of religious issues to see if his construction of them really stands on its own. I do enjoy literary criticism, especially when I'm the critic. If I can get though them all I'll post a review. I hear the third book is where the theological action gets fast and furious. I'm glad to here someone else struggles with fiction. Also, I think you are right about the oppressive structures. Most of the better Christian responses I've read to His Dark Materials are in perfect agreement with Pullman: If God is like that, then we'd kill him too! It would be a Christian's duty. Touché! concerning parsimony over accuracy. Regarding the books: I'm hoping there is a payoff after I finish all three. But there might not be. I just want to see if all the fuss in the Christian community was really worth it. Btw, doesn't the final Narnia book end with Aslan saying to a Tash-worshipper (Tash is the Satan-figure): "I and [Tash] are of such different kinds that no service which is vile can be done to me, and none which is not vile can be done to him. Therefore if any man swear by Tash and keep his oath for the oath's sake, it is by me that he has truly sworn, though he know it not, and it is I who reward him. And if any man do a cruelty in my name, then though he says the name Aslan, it is Tash whom he serves and by Tash his deed is accepted." Basically, Lewis is saying that all virtuous deeds--done under the service of whatever named god, even satan apparently--is actually service to Aslan (the true God). Now why are Christians all upset about Pullman when Lewis has this theology going on at the end of his series? Where are the Christians banning the Chronicles of Narnia? I'm sorry I missed it. Kyle called when we had company. Saw the movie with my nine year-old grandson. His review: "Cool bear. Cool flying cowboy. The compass is like my dad's blackberry. Bad guys are control freaks and mean to animals and kids." Then as we were driving home he said: "Aubrey shouldn't see it. Too scary for her. She would poop in her pants." I said, "Well, when you say that, aren't you acting like the Authority." He looked puzzled for a moment and then said: "I don't think so, because I love my sister." Hmmm. It seems to me that some in the Christian community, operating out of sky-is-falling paranoid fantasies rather than hope, get into a dither about much that is time- and energy-wasting. These folk are reptillian "fear carnivores." Pullman's stuff is their red meat. If they knew about it, this blog would be their raw brisket! I always wonder about the end of TCON because I understand (especially from the quoted passage) that there is some sort of implicit connection between Tash and Satan, yet the Calormenes are almost unequivocally described in terms that would apply to Arabs (hence making a connection between Tash-worship and Islam). I am very tempted to say that Lewis might have been hinting at the idea that Muslims, despite the fact that they serve a false god (or at least a false conception of the God of Abraham), are really serving the "true" (conception of) God of Christianity when they do good and being idolatrous or exploitative of their religion when they do bad things. That of course doesn't minimize the impact of what you're saying, but I think that an exegesis of the theology in TCON is more difficult than you propose at face value. Also, your question might be easily answered with your point #1: Whereas Pullman has hinted at his negative feelings toward Christianity and religion (hence giving some suspicion that he's out to undermine either or both), Lewis obviously had no such agenda, and it would be a much greater stretch to assume so based on the theological implications of the Tash/Aslan situation in The Last Battle. I have seen quite a bit of disapproval with Lewis' treatment there, so it's not like Christians have turned a blind eye to it (although we might be willing to give Lewis the benefit of the doubt moreso than Pullman). That's a little prophetic on your part. In the third book the I Ching is used in somewhat the same way as the aletheiometer is used. I'm partial to the aletheiometer myself.